When you travel, your life is enriched in so many ways. Every time I travel to a new country and immerse myself in it, there’s at least one thing from the ‘foreign’ culture I wish I could bring back and add to my own American culture. The concept of pulling the best out of each country and creating a ‘super-country’ is kind of like a Hollywood script – unbelievable. However back in the 80’s 2 young guys taking a gap year backpacking in Europe did just that on a smaller scale; with beer. Dan and Rich, graduated from Harvard and decided to go out and see the world, or more accurately go out and drink what the world had to offer. After backpacking through Europe, they fell in love with the beer culture, and upon returning to the US, they were disappointed with the beers in America. They did what any other beer lovers with a Harvard degree would do, they got their MBA’s and started Mass Brewing Company producing Harpoon beer. I was surprised to find out that only 1 1/2 miles from where I’ve been staying for the last 5 weeks is the home of Harpoon Beer. 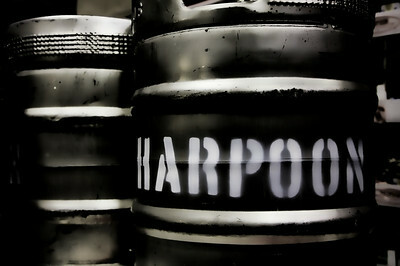 Since I’m not from New England, I hadn’t really heard about Harpoon beer before, but was surprised to find out on their website they are one of the largest specialty beer producers in the US and the 3rd largest brewer in New England. I also learned the brewery only runs tours on the weekend, so I decided I would do some ‘traveling’ of my own, and walk the 1 ½ miles to the brewery for the $5 tour. I didn’t need a map, all I had to do was follow my nose – to the smell of fish. The brewery is located in the Marine Industrial Park and seaport of South Boston. As I walked away from all of the cute little row houses of Southie, my surroundings quickly changed to long square-box buildings in various forms of disrepair. This also seemed to be the area where all of the bus charters came to rest when they weren’t chartered. Amidst this collection of warehouse buildings, buses, construction, and a fishy odor stood Harpoon Brewery. I looked at my watch before I entered; it was noon, perfect, it was officially ok to be drinking beer.